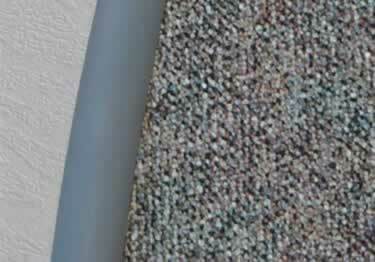 Johnsonite Standard Transition Adaptors provide smooth transitions from carpet flooring to wood, ceramic or resilient the flooring, even when floors have varying thicknesses. Made from high quality PVC, these adaptors provide the perfect, professional flooring finish. Will this work on an "s" curve from laminate to tile? Can I send a picture? Does this transition work between ceramic tile and wood laminate flooring. Also, with 90 degree radius? Does A515 have an adhesive backing on it? I have indoor/outdoor carpet on concrete inside and I need something that will make a smooth transition and stay without coming off. This carpet is very thin. There is no padding under it. Will this fit this carpet and stay on? This product was exactly what i was looking for helped me transition the carpet to the vinyl with ease. Product arrived quickly and was easy to apply with adhesive that was reccomended. Will purchase from Koffler again in the future.